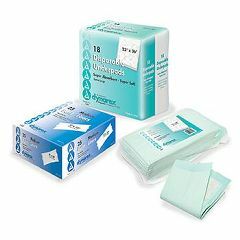 Dynarex Disposable Underpads - 23 x36"
The Disposable Underpads is highly absorbent, soft fluff fill. It is waterproof with a non-skid blue backing. All four sides are sealed to prevent leakage. Not so absorbent. liquid tends to . Good for pets with urinar. We use these pads to help keep our carpets clean. Our dog has urinary problems, so we have these pads placed under blankets were the dog lies. Works great! I use these for my small dogs (tiny dogs) and these don't have near the absorbency that the Prevail brand does. Actually, I should say they don't even come close...I guess you get what you pay for. I tried to save a few bucks, now I wasted $30. Spend a few extra dollars and get Prevail. I must confess - I use it around an elderly pets litter box for those occasional accidents - work great, and is a good value for the money.